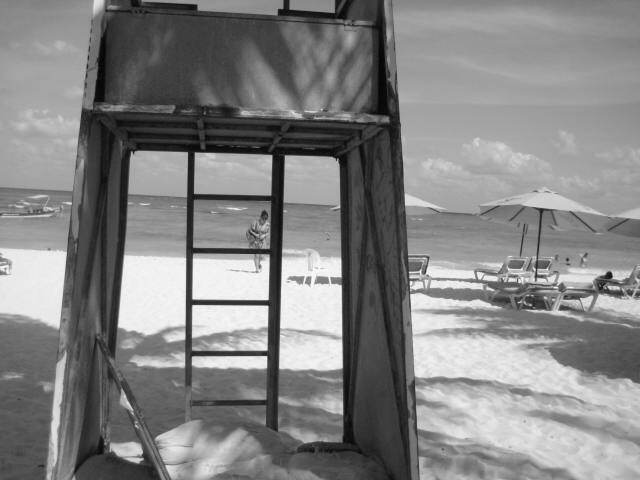 TAKING A BREATHER: Deseo is a boutique hotel in Playa del Carmen. It’s unusually quiet in these post-swine flu days. I’m not a gangster. I like to see how they might live, though. After a week and some change of swine flu ravaging my psyche and my ability to sit down and drink a cup of coffee and surf the nets while in Mexico City, I’ve decided to hitch a ride with the Chilangabacha to the pristine shores of the Riviera Maya on Mexico’s Yucatán Peninsula. It’s quiet here. Flu-scare quiet. Not everyone had the idea to take a swine flu vacation. We flew out of Toluca, just to avoid any madness at Mexico City’s main airport. Before we even got to the metal detectors we had to fill out a short medical evaluation. A form with those “Yes” and “No” medical questions. Of course I checked “No” all the way down without bothering to look at most of the questions. Didn’t matter, they were prepared for people like me. An airport security guy had a gun-shaped thermometer at my throat. My temp was normal, he yelled to two medical people seated at a table. Just imagine if I was trying to get back to N.J. but had the swine flu bug oiking away in my bloodstream. No quarantine for me, thanks. I much rather have a stay near this biki-top optional beach.